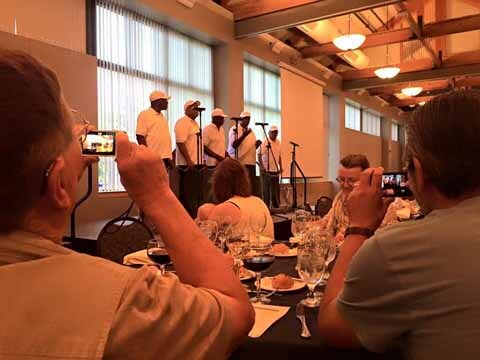 ALHFAM members enjoyed crab cakes and the Northern Neck Chanty Singers at the 2015 Annual Meeting & Conference hosted by Colonial Williamsburg. Check out the CW food blog: History is Served. Thanksgiving is my favorite holiday. For my family it is a time to gather together to express our thankfulness for the blessings of the last year and look with hope towards the future. It is a time of togetherness and comfort . . . and food. One thing I am personally thankful for, every year, is ALHFAM. 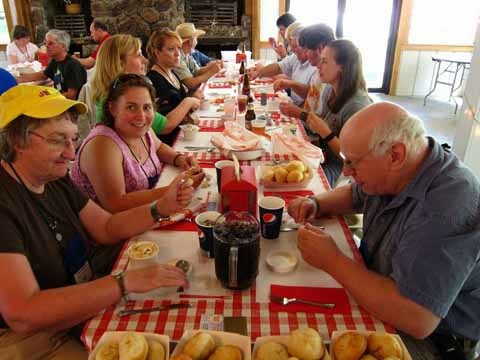 ALHFAM conferences allow me to gather with like-minded folks to learn, connect, and, of course, eat food. Good food. ALHFAM members take their food seriously. Want to learn how to cook in a beehive oven, from a receipt centuries old, or start a brewery on your site? Someone in ALHFAM can help you (and will and will probably feed you too). So for Thanksgiving, enjoy these images of ALHFAM meals past (with links to recipes). 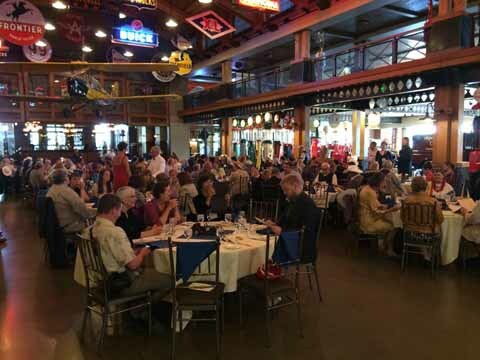 ALHFAM gathering for a meal in 2014 in Calgary at Heritage Village’s Gasoline Alley. While poutine wasn’t on the menu that night I know several people who indulged more than once during this conference. For the uninitiated, here’s a recipe. Happy conference attendees about to enjoy a lobster boil at the 2010 Annual Meeting & Conference hosted by Old Sturbridge Village. There were no lobster recipes on the OSV website, so here’s one for cranberry sauce. At least it’s in keeping with the Thanksgiving theme. This entry was posted in ALHFAM, Annual meeting, food and tagged beehive oven, Colonial Williamsburg, Gasoline Alley, Heritage Park, historic receipts, historic recipes, Lobster Boil, Old Sturbridge Village, Poutine, Thanksgiving. Bookmark the permalink.